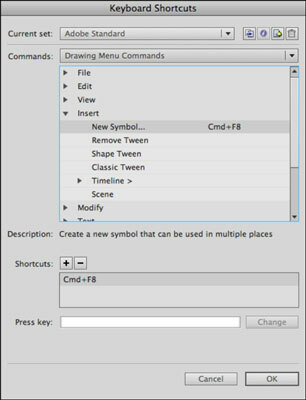 Part of creating a smooth and fast work environment in Adobe Flash CS6 is having your favorite commands, panels, and tools at your fingertips. Most Flash menu items and panels are equipped with shortcut key combinations that provide easy access without having to comb through several menus. If you need your own, custom keyboard shortcuts, Flash lets you create and save keyboard shortcut sets that you can fully customize to speed your workflow. To view the default keyboard shortcuts and create your own, choose Edit→Keyboard Shortcuts (Windows) or Flash→Keyboard Shortcuts (Mac). You can map almost any available tool, command, or panel to a keyboard shortcut. You can choose to memorize existing keyboard shortcuts for commonly used items or create custom keyboard shortcuts that are more intuitive for you. Choose Edit→Keyboard Shortcuts (Windows) or Flash→Keyboard Shortcuts (Mac). The Keyboard Shortcuts dialog box launches. Scroll down and click the plus sign (Windows) or triangle) to the left of where it reads Control. You see all menu items on the Control menu and any keyboard shortcuts assigned to them. Locate and select the menu command you want to create a shortcut for. For this example, select Insert→New Symbol. The default set can’t be modified, so you need to duplicate the default set and make changes to the new copy. Click the Duplicate Set icon at the top of the dialog box and type My Custom Set in the Name text box when prompted; click OK to create the new set. With the current menu item selected, locate and click the plus sign beside Shortcuts to add a new shortcut for the menu item. The word <empty> appears, ready for you to enter a keyboard shortcut. Hold down Ctrl+Shift (Windows) or Command+Shift (Mac) plus the key you want to assign as the keyboard shortcut (for example, Ctrl+Shift+M or Command+Shift+M). Use a letter or a number for a keyboard shortcut. You can also use the Shift, Ctrl, and Alt keys (Windows) or Shift, Command, and Option keys (Mac) in combination with a letter or a number to create keyboard shortcuts. You may receive a warning if the keyboard shortcut you’ve selected is already in use. Make sure the shortcut isn’t assigned to a crucial menu command before you decide to overwrite it. The Shortcuts text box fills in the keyboard shortcut as you hold it. Note that if the keyboard shortcut already exists, a warning appears. To confirm the shortcut, click the Change button. Click OK to close the dialog box and save the shortcut to your new set. At any time, you can return to your custom set in the Keyboard Shortcuts dialog box to add new shortcuts or modify existing ones. If at any point you want to switch sets, return to the Keyboard Shortcuts dialog box and select a different set from the Current Set menu.